In order to bring innovation to our customers, we created an internal R&D department. Our commitment, the results and the competencies that we acquired, transformed the “innovation department” in a landmark for all the technical divisions. This area operates independently and the results of the research influence the competencies and the development of all the other divisions in the company. Following there is a selection of some strategic projects. A project in cooperation with The Corpora – Robotic Company. Tu.Tino is the name we gave to the Turin Tech application of Q.bo. 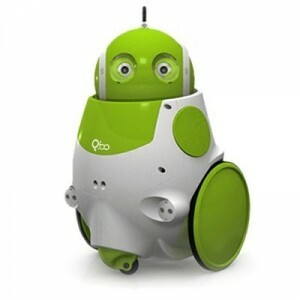 A team of talents of Turin Tech are working with the robot with the goal to get a domestic device, able to go around alone, to recognize our faces, to talk with us, to stream audio and video to remote devices. Tu.Tino is based on Arduino and Linux, full of sensors, with two cameras and text to speech / voice recognition capabilities, it is a totally open platform from an Hardware and software point of view; so it is also a good tool to exercise our development capabilities in all the main areas of electronics and mechanics. 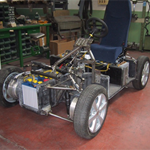 Design of a completea electric-powered vehicle: settings and development of CAS, prototype development check, homologation testing, production engineering. 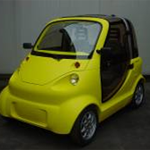 Quadricycle with high performance battery (lithium ion): elaborated in two versions, short and long. All design activities have been supported by simulations and structural calculations to ensure on the design phase the construction of components that would be compliant to the customer specifications and by the Approval Authority. 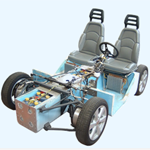 The propulsion system consists of four twin drives, based on permanent magnets brushless with hollow rotor, which are well suited for their features, to be fitted inside the wheels. 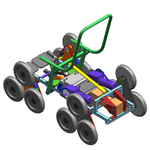 OL.3 is a vehicle with multiple configurations and electric engine. 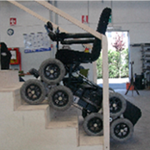 OL.3 is able to face flat and uneven paths and allows people to go up and down in staircase in autonomy and safety. 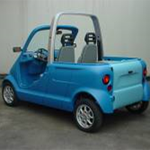 The vehicle ensures comfort and stability without sliding on surfaces. We designed two different versions, one for internal use and the other one for external use.